TOKYO (AP) ― A cooing, gesturing humanoid on wheels that can decipher emotions has been unveiled in Japan by billionaire Masayoshi Son who says robots should be tender and make people smile. Son’s mobile phone company Softbank said that the robot it has dubbed “Pepper” will go on sale in Japan in February for 198,000 yen ($1,900). Overseas sales plans are under consideration but undecided. The machine, which has no legs, but has gently gesticulating hands appeared on a stage in a Tokyo suburb, cooing and humming. It dramatically touched hands with Son in a Genesis or “E.T.” moment. “Our aim is to develop affectionate robots that can make people smile,” he said. The 121-centimeter-tall, 28-kilogram white Pepper, which has no hair but two large doll-like eyes and a flat-panel display stuck on its chest, was developed jointly with Aldebaran Robotics, which produces autonomous humanoid robots. It also has two cameras and four microphones on its head and has Wi-Fi and Ethernet networking capabilities. Up close, it bears a resemblance to C-3PO in “Star Wars,” especially in its clueless look. 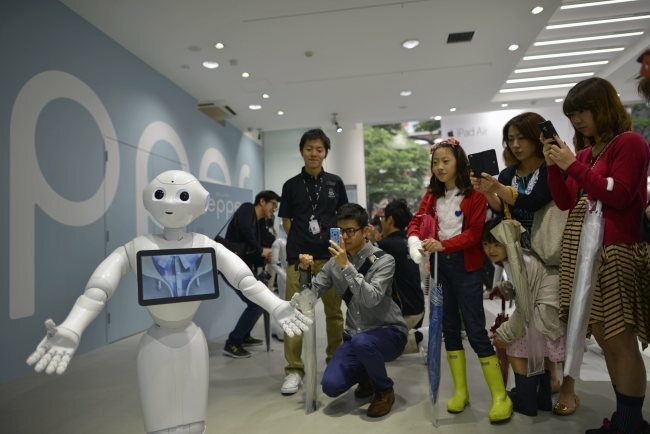 But a demonstration Friday at a Softbank retailer in Tokyo highlighted the robot’s shortcomings as much as its charm. Voice recognition takes a while to kick in, when its eyes light up in a listening mode after the robot stops talking, making for less than spontaneous dialogue, similar to the frustration one experiences talking with iPhone’s Siri. Pepper was more fluid with its own chatter, such as asking “Do you do Twitter?” or “Is this the first time you ever spoke to a robot?” But it wouldn’t really wait for an answer, rattling on to the next topic. In the demonstration, Pepper sang, “I want to be loved,” and it did more singing and gesturing with its hands Friday. Cuddly robots are not new in Japan, a nation dominated by “kawaii,” or cute culture, but no companion robot has emerged as a major market success yet. Sony Corp. discontinued the Aibo pet-dog robot in 2006, despite an outcry from its fans.